On Tuesday, January 9, 2018, Hemet Unified School District held its annual Spelling Bee in the District Office Board Room. Western Center Academy student Aileen Luke, who won fourth place last year, was announced as the winner after she correctly spelled the word “pristine”. Luke will advance to the county level to compete in the County Spelling Bee. Hemet Unified has been participating in the Riverside County Spelling Bee since 1978. That year a student from Hemet Unified, LeAnn Fiske, won the Riverside County Spelling Bee. Over the past 41 years, Hemet has placed 22 times in the county bee and won five times. In order to participate in the district-level Spelling Bee, students from 4th to 8th grade participated in their school’s spelling bee. Students who won first and second place at their site were invited to compete at the district level. Forty-six students attended the event and competed against their peers. After 28 rounds, Aileen Luke was announced as the first place winner. 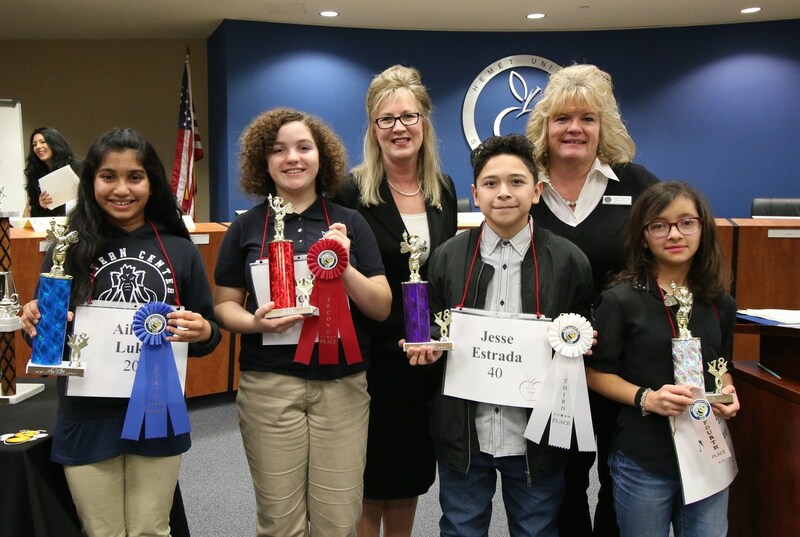 Ahnika Pena from Western Center Academy won second place, Jesse Estrada from Rancho Viejo Middle School won the third place spot, and Martina Navarrete from Idyllwild School was named the fourth place winner. Students were called up one at a time by the Spelling Bee Master, Michelle Badura. They were able to ask the origin of the word, a definition, and if there were alternative pronunciations. The panel of six judges present were there to ensure students received correct information and spelled their word correctly. A big thank you to this year’s Spelling Bee panel: Merri Snow, Head Judge, Dagmar Rea, Judge, Elizabeth Areiza, Judge, Andrew McGuire, the Arbitrator, Sylvia Ortiz, the Timekeeper, Linda Rush, the Challenge Recorder, Karena Chum, the Round Advisor. Also thank you to Director of Elementary Education, Annette Davis-Thole, and Pat Linan for your support in creating this year’s district-wide Spelling Bee! Congratulations to all district-level contestants and our four winners. We wish Aileen Luke the best of luck as she competes in the County Spelling Bee on February 28, 2018 at the Moreno Valley Conference and Recreation Center!